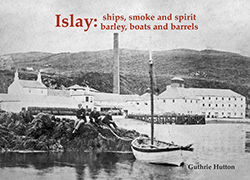 Stenlake Publishing - Islay; Ships, Smoke and Spirit; Barley, Boats and Barrels. Islay: Ships, Smoke and Spirit; Barley Boats and Barrels. Alliteration runs riot in the title of this new book in which detailed research, observation and commentary from Guthrie Hutton married with freshly-discovered period photographs, take us on a tour of the Scottish island which is, above all, renowned for its whisky. The peaty flavours of the island's famous spirit depend on traditional preparation, geology and geography for their distinctiveness and there are subtle and some not-so-subtle differences between the various distilleries and areas of the island. Islay was also once the ruling seat of the Lords of the Isles. Guthrie Hutton has blended together (forgive the pun we couldn’t it) the history of the island with the history of its principal industry and the well-crafted text reflects his love of both.